Overall the thirties and early forties were good and innovative years for the Chevrolet marque. In 1933 Chevy introduced two classes of car, the Master Eagle for the upscale market and the mid-year arrival Mercury for the budget-conscious. Styling was more streamlined on the Eagle, bumpers were standard, and Starterators were included. Starterators connected the accelerator to the starter motor, enabling a driver to restart an accidentally stalled engine with the tap of a foot. 450,000 Eagles were produced during the 1933 year and customers began referring to the Eagle as the Master. The name change stuck. In 1934 Chevrolet stressed speed on the Master with its "Blue Streak" engine; cars could reach 80 mph with 12% greater fuel economy. The Master had graduated to a 112-inch wheelbase and had as an option "Knee-Action" front suspension (also known as Dubonnet independent suspension, it provided true vertical motion to the front wheel and meant improved handling and ride). As 1934 ad text had it, "The same old roads — but a brand new ride." More modern styling was topped off with a new design for the dashboard and a snazzy rear mount tire. Targeting middle-class purchasers, Chevrolet claimed its 1935 Standard and new Master DeLuxe (upscale version) brands were "The Most Finely Balanced Low-Priced Car Ever Built." The Master DeLuxe with its all-steel body was an inch longer than the 34s and came in several body styles, all with suicide (rear-hinged) doors. The two-passenger coupe sold for $560 and the Sport Coupe with rumble seat for $600. The two-door Coach cost $580 and the four-door version $640. The buying public expressed a real preference for enclosed models and for models with a trunk option. But customers weren't really biting on these cars; Chevrolet sales gave way to Ford's for the first time since 1930. Sales came back in 1936 with the debut of 4-wheel hydraulic brakes, front-hinged doors, a narrower "fencer's mask" radiator grille, more bright work, and smaller, longer headlights. Master seat cushions were built with individually wrapped coils for greater comfort. Contrasting wheel paint and whitewall tires set off the Master DeLuxe hailed as "The Only Complete Low-Priced Car". Chevrolet's 1937 Master and Master DeLuxe were also marketed as "the complete car, completely new." After investing $26 million, an amazing sum in those days, to retool the car, Chevy was anxious to let the motoring public in on the impressive results. Jules Agramonte, designer of the 1934 LaSalle and a stylist in Harley Earl's Art & Color Department, had delivered what Earl called "Diamond Crown Speedline" styling. The body was a stronger version with the box girder chassis frame, longer and wider than prior years with more ample interior space. For the first time the body was all-steel, surprisingly reducing its weight by roughly 150 pounds. There were six body types, three each for the Master and Master DeLuxe versions. Wheel size was reduced to 16 inches, leading to a lower profile. But the real design highlight was a downward sloping body crease (speedline) that began in the space between the far end of the hood and front fender, crossed the cowl, and continued onto the front door — very sleek. There was a new, larger 6-cylinder engine, as well, rated at 85 hp, the same rating enjoyed by Ford's popular flathead V-8. There were hydraulic brakes, three-speed synchromesh manual transmission, and hypoid gears rather than the earlier spiral bevel cogs. The cars also sported upgraded upholstery and extras like sun visors and an arm rest on the passenger side. Chevy bumped the price up, too, by a few hundred dollars — but sales still outpaced Ford's. In light of a significant change facing General Motors, that was quite an achievement. Throughout most years of the Great Depression period they maintained a 10% profit margin. That was quite a feat, managed in part by closing some plants, laying off workers, and reducing salaries and wages. Assembly line speeds increased and workers had to work overtime — with no extra pay. Many jobs were dangerous and benefits were few. Workers complained that these working conditions left them exhausted and ill.
GM, aware of labor unrest, did what it could to run a tight ship, paying significant sums, for instance, to private detectives who spied on union activities. In December, 1936, GM refused to meet with UAW representatives to discuss conditions. When rank-and-file workers learned of GM's plans to relocate the dies used to shape Chevrolets and Oldsmobiles from Fisher body Plant No. 1 in Flint, Michigan to other plants with fewer UAW members, they called a sit-down strike. It took fewer than a thousand workers only an hour to shut down production, and they wrested control of the smaller, nearby No. 2 plant, as well. Since they remained in the plants, management couldn't (short of bloodshed, anyway) get scab workers in to restart the equipment. A week later sit-downs and lockouts spread to other GM operations in the Midwest. Management tried to prevent food from reaching the workers, and then, with outside temperatures in the teens, turned off the heat. Police attacked the workers but were driven back. The governor called out the National Guard. It took two and a half months but with its annual production schedule jeopardized and prodded by President Roosevelt and others, on Feb. 11, 1937, GM recognized the UAW as the official bargaining agent for auto workers. The agreement led to pay raises, retiming of jobs to do away with accelerated production lines, and rehiring of fired workers. Chevrolet may have been a bit tired after the UAW fight. At least its 1938 advertising slogan seemed to be: "The Car that is Complete." 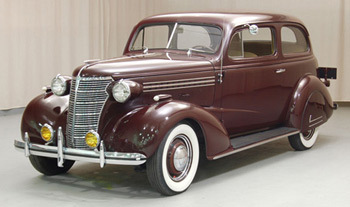 There weren't many changes from the '37 year but one striking distinction came in the die cast front grille which now had horizontal bars, a design change courtesy of Franklin Q. Hershey who had left Pontiac to join Chevrolet. Less visible changes included heavier valve springs, worm-and-roller steering, a better water pump, and a voltage regulator. For greater stability the rear tread was also widened by two inches. The DeLuxe model cost $61 more than the Master series but customers saw its advantages and the DeLuxe version outsold the Master almost 2:1. Having shelled out the extra cash, drivers were proud of the "Master DeLuxe" inscription on the car's side grille. Advertised as an ideal family car, this was the come-on for new customers: "You'll Be ahead with a Chevrolet! The Car that Is Complete" "Chevrolet is brisk! It's nimble! It goes places the way you want it to go. . . in style and comfort and Perfected Hydraulic Brake safety. . . because it has the basic structural superiorities which mean better motoring results!" 1938 held its own challenges for Chevrolet and all of GM. It was the year of the Roosevelt recession, a temporary reversal of the economic recovery following the Great Depression. The recession coupled with an average 4-1/2% increase in Master prices (though the car was little changed from 1937) caused sales to plunge to 893,328 units, more than a 40% decrease from 1937 levels. Nonetheless, GM continued as the industry leader. The Master Series vehicle was renamed the Master "85" in 1939 though the Master DeLuxe name was kept. The 39s had a longer hood with headlamps set lower, a running board edged in stainless steel, and stainless steel strips outlining side hood louvers. Chevrolet introduced its first factory-authorized station wagon, as well — a woody with side mount spare tire. A new suspension system utilizing coil springs and wishbones was introduced to the DeLuxe line. Power operated by a vacuum cylinder, the column-mounted gearshift was easier to shift. A clock was set into the glove box and radios were offered with six buttons to preset stations. One ad was headlined with this slogan: "Only Chevrolet gives so much for so little" and customers seemed to agree. Slightly reduced prices helped boost sales by about 30%. Aiming to cement the Number One sales slot in 1940 Chevrolet went with a full body redesign known as "Royal Clipper Styling," "new from bumper to tail light". There were three series that year — the Master 85, the Master DeLuxe, and the new Special DeLuxe that came with all the bells and whistles. The cars were larger inside and out with streamlined bodies, lower, wider grilles, and rear-hinged "alligator jaw" hoods. Touted as the "newest, safest, and most scientific lighting system ever designed" sealed headlights were offered and all models included an impressive array of equipment: dual windshield wipers, lighted instrument dials, illuminated head-lamp beam indicator, etc. "Eye It, Try It, Buy It!" was the tagline encouraging sales. Drivers benefited from a smoother, quieter ride, rust proofing of the entire body, and a larger "tiptoe-matic" clutch. The new Special DeLuxe, the year's biggest seller, featured an ashtray, assist straps, visors, illuminated electric clock, glove compartment light, and T-spoke (three-spoke) steering wheel with horn ring. The economy was back and customers long used to pinching pennies were now ready to pay for such extras. Increased sales whetted Chevy's appetite for even more improvements in its 1941 Master DeLuxe and Special DeLuxe (no more Master 85) cars. The traditional GM lineup for cars was Chevrolet for the budget conscious, Buick for those a little better off, and Cadillac for those who could afford to show off a bit. 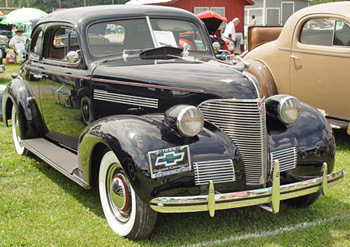 In 1941 Chevrolet's styling more than ever resembled that of Buick's. The cars with a real wow factor were larger (wheelbase was now 116 inches) and heavier with headlamps set into the fenders and powered by a 90-hp engine known as "Victory Six" (tribute to the war besetting Europe). Even with slight increases in price, the motoring public was impressed enough to boost sales appreciably — more than a million units. Why mess with success? 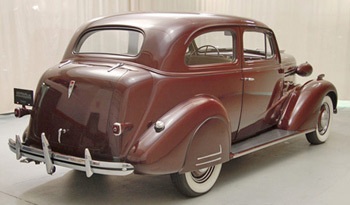 The 1942 Master Deluxe and Special DeLuxe closely imitated the 41s (apart from a shortened grille and front fenders that arched over onto front door panels) and were advertised as "The Finest Chevrolet of All Time". The Fleetline Aerosedan, an impressive two-door fastback, was added to the lineup. Cars weren't the first thing on the mind of the public, though. Pearl Harbor was hit on December 7, 1941. On New Year's Day 1942 strategic resources including rubber, plastics, and metals were ordered diverted to military use. Rather than bright work the automotive industry went to more painted trim, producing models with far less flash known as "blackout specials". Chevrolet began advertising itself as aiding national defense and production slowed. On February 1 the federal government ordered the cessation of all civilian car production. From 1943 through 1945 General Motors built military cars and trucks and encouraged its customers to buy war bonds. When the war ended, Chevrolet picked up where it had left off but renamed its series. The Master DeLuxe was now the Stylemaster and the Special DeLuxe the Fleetmaster . It was in November 1945, however, that the UAW called a major strike against GM, demanding a 30% increase in wages — not based on cost of living but rather on management's ability to share its wealth. The strike lasted 113 days. Chevrolet was hit particularly hard as it struggled to meet pent-up demand and Ford sales surged ahead. For nearly a decade Chevrolet had, with its Master series, continued to innovate, invent, and improve an American classic. It concentrated on parallel tracks of body styling and mechanical upgrades. For nearly the whole time the Master series was available, it "Mastered" the market, captured the popular imagination, and kept Chevrolet ahead in sales.